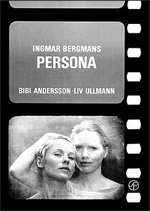 Alma (Bibi Andersson): Maybe I should tell you a little about myself. Mr. Volger (Gunnar Björnstrand): How can I say it all without losing myself? Without boring you? I … I … uh … well, for the last thirty years I have been employed as a copywriter. In the intimate well-lit closeup of his face, the camera frames a window to a soul with a crooked grin playing sinister (pointing somewhere in the direction of guilt). That he may be hiding something is an assumption not easily dismissed by the awkward stammer that sets off his introduction. While someone else might simply announce, “I am a copywriter,” his choice of words is more calculated—he has been employed as a copywriter—as if revealing a half-truth or attempting to forge distance from the confines of his own reality. Meanwhile, to his right, another man listens intently, hanging on his every word. The silent man’s mouth quivers almost in syncopation like that of an understudy practicing in wait. The Doctor (Margaretha Krook): The hopeless dream of being—not seeming, but being. At every waking moment, alert. The gulf between what you are with others and what you are alone. The vertigo and the constant hunger to be exposed, to be seen through, perhaps even wiped out. Every inflection and every gesture a lie, every smile a grimace. A dissolve to a man on a stage delivering a powerful soliloquy reveals an audience enthralled as the actor ruminates about internal suffering. Background music plays that some in their seats may recognize as the collaboration between Sparklehorse and Danger Mouse, Dark Night of the Soul, although a guess is that most will not know this without reading the Playbill. The backdrop of the stage is fitted with a large screen where short random scenes and stills project in equally random if not jarring sequence. Wile E. Coyote chases The Road Runner. A still of John Lennon signing the Double Fantasy album cover for the man who will murder him six hours later. A mushroom cloud resulting from the detonation of an atomic bomb paints plumes of acid rain over an unsuspecting horizon. A crazed catfight between Joan Collins and Linda Evans disturbs the tranquility of a lily pond. President Reagan walks out of the Washington Hilton Hotel just as the film projects burning scorched edges from the melting strip before the screen turns white. The Doctor: Your hiding place isn’t watertight. Life trickles in from the outside, and you’re forced to react. No one asks if it is true or false, if you’re genuine or just a sham. Such things matter only in the theatre, and hardly there either. A voice from off-screen appears to be that of an interviewer. Where do you see yourself in five years? The applicant blinks. An answer does not come readily. In five years, he will be doing what he has always done. Burying himself in his writing. Alma: Elisabet? Can I read you something from my book? Or am I disturbing you? It says here: “All the anxiety we bear with us, all our thwarted dreams, the incomprehensible cruelty, our fear of extinction, the painful insight into our earthly condition, have slowly eroded our hope of an otherworldly salvation. The howl of our faith and doubt against the darkness and silence, is one of the most awful proofs of our abandonment and our terrified, unuttered knowledge.” Do you think it’s like that? There is no hidden agenda or attempt to show a desire to climb a perceived corporate ladder. In private time, he will continue writing for himself, adding to his growing collection of unpublished essays, short stories, and miscellaneous, uncatalogued chapters. Mr. Volger: The important thing is the effort, not what we achieve. With a subtle shift in perspective, a scene is replayed. The camera is this time focussed on the silent man’s face listening to the man delivering the same lines as before. There is an uncanny resemblance between the two men. I … I … uh … well, for the last thirty years I have been employed as a copywriter. I have worked for many high profile clients. He proceeds to list them matter-of-factly, each passing sentence a bullet point from a neatly formatted resume comprising the entirety of his professional existence. Alma: Is it really important not to lie, to speak so that everything rings true? Can one live without lying and quibbling and making excuses? Isn’t it better to be lazy and lax and deceitful? Perhaps you even improve by staying as you are. The interview is over. The copywriter and the silent man by his side fade to black, but in the darkness, sound remains: clicking and clasping, metal upon metal, footsteps walking to and fro, the dull murmur of voices, a crew at the end of the day’s shoot collecting their gear.